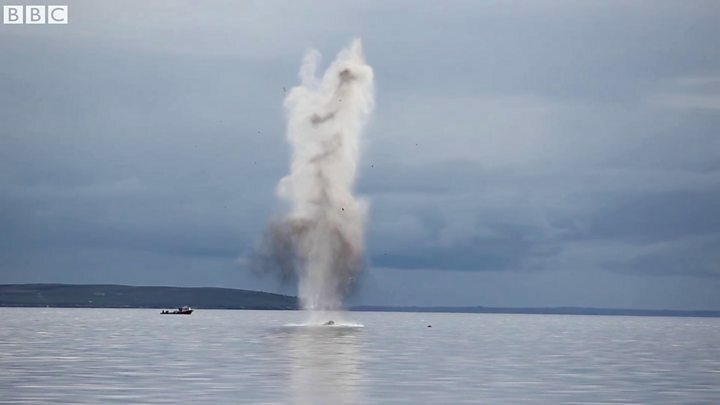 Royal Navy bomb disposal experts have detonated a World War Two torpedo found in Scapa Flow in Orkney. It is believed to have been one of those fired at HMS Royal Oak by a German U-boat in 1939. A total of 833 men were killed in the naval disaster. The seven metre (22ft) long torpedo was found lying in 35m (114ft) of water during a routine sonar seabed survey in February. Royal Navy divers carried out two controlled explosions to make the harbour safe. The first separated the warhead from the body of the torpedo, while the second destroyed the explosive device which had floated to the surface. Orkney Islands Council now hopes to put part of the torpedo on public display later this year. The council's deputy harbour master, David Sawkins, said: "The torpedo had been sitting on the seabed of Scapa Flow for almost 80 years. "Although it posed minimal danger to shipping, our responsibility is to operate a safe harbour and, as it was likely to contain live explosives, the prudent course of action was to alert Royal Navy bomb disposal experts and arrange for its safe disposal. "This was carried out with great professionalism by the Navy divers and we are grateful for their assistance and expertise. "The hope now is that the rear section of the torpedo, including the propeller, will be recovered and after a full examination returned to go on display in Orkney later in the year. "It would be a poignant reminder of the huge loss of life when the Royal Oak went down in October 1939." Scapa Flow was used as a Royal Navy base in both world wars and is now popular with divers due to the British and German relics lying on the seabed. More than 50 German ships were deliberately sunk in the area at the end of World War One by their commanders to stop them being divided among the Allies.